My grandmother used to call them "dichos", that is sayings that you use to teach your children. The most famous "dicho" of all is no doubt the Golden Rule, to do unto others as you would have them do unto you. The sad truth is that, as a board member, you will often find that people will do unto you things it never would have crossed your mind to have done unto them. It can be a tough world out there. Here are some proverbs that you might want to repeat to yourself often as a board member. 1. You can't please everybody. No matter what you do, how hard working you are, some people will be unhappy with you. We want everyone to love us, or at least like us, or at the very least not hate us. Aint gonna happen. Deal with it. 2. I don't know the key to success, but the key to failure is trying to please everybody. Not only can you not please everybody, you shouldn't even try. I used to think that the most important virtues were courage and honesty. The longer I have been a board member, the more I am convinced of the need for perseverance. Maybe Dr. Longie is right in this podcast, maybe the most important virtue depends on the situation. Currently, I am president of a board and there are some people who are constantly criticizing everything I do. These same people criticized the last four or five presidents as well, all of whom were very different from me and very different from one another. 5. Not every difference of opinion is a difference of principle. Just because someone disagrees with you on an issue doesn't make that person a bad person or your enemy. There probably are some people who are both evil and your enemy, but it certainly isn't everyone who disagrees with you. 6. Do it for the cause, not the applause. Willie Davis, Spirit Lake Consulting consultant uses this line often to encourage volunteerism. Remember why you are on this board in the first place. You believe in the mission of this organization, that education is important, that this program helps people with disabilities find jobs, or whatever it is that you're doing. 7. Focus on the positive. While this may sound a bit like something out of a Disney children's movie, it is good advice. With all of the criticism you will get it is sometimes easy to get discouraged. Remind yourself of the good you have done, of the people who are helped by your organization, of the caring volunteers and competent staff members. There is probably a lot of that to focus on. If there really isn't, maybe you are in the wrong organization. I was reading a book today, The Geography of Bliss, by Eric Weiner who was searching for the happiest places in the world. One of them, he says, is Iceland, where some people attribute their happiness to "the willingness to fail". Dysfunctional boards are often comprised of factions looking for the slightest failure to trumpet as proof that their faction should be in charge. If the dominant group changes, there is no real improvement, just a different faction complaining bitterly. Don't let that affect you. Do your best and accept the fact that there will be failures. Try to learn from those and not beat yourself up. A friend of mine told me this was a saying he heard from an excellent pool player but that it turned out to be true 90% of the time whether it was business, boards or billiards. So, see the naysayers what they are, do your best and focus on why you are there in the first place. "Let me introduce you to your Joe. Joe appears to have super natural powers. He seems to be working at several jobs at the same time, and I know I met him at each reservation I visited. Joe, as well as being unemployed for an extended length of time, has held a variety of jobs. He was a dishwasher and bus driver at the school, employed by a grant, worked at the college and for the tribe, at one time was program manager, board member, and even served a term as tribal council member. In short, Joe has held almost every tribal job there is. Joe, the Tribal Worker, is a very dangerous man. Why do I say Joe is dangerous? Because of the irreparable harm, he does to his reservation community while serving his own self-interest, because self-serving individuals who strive for power are most likely to abuse it. They do not have the virtues, integrity, and wisdom to use power and influence fairly and correctly. Joe will not hesitate to rig elections by swaying mass opinion about ethical candidates; he is not above blackmail, bribery, or intimidation to further his needs. For example, when Joe was employed as an administrator at the school, he did not care if his actions hurt the education of children (even his own). He looked at the school as an employment agency for his relatives and fought very hard to get them hired." 1. How much is Joe responsible for his own unethical behavior? 2. Is Joe's supervisor responsible for his behavior? If so, how? 3. Is the tribal council responsible for his behavior? If so, how? 4. Are we, as co-workers or fellow community members responsible for his behavior? If so, how? I was particularly interested in the last question, where respondents were asked their PERSONAL responsibility. Erich and I interpreted this chart very differently. 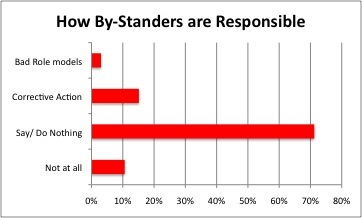 He thought that since only 10% of those who answered said that co-workers, community members and other by-standers were not responsible that tribal members recognized they were a part of the problem. I disagreed. "The other workers are late as well." "We are responsible by not doing anything." "No courage to talk up." "We have a duty to confront Joe and to report Joe to his supervisor and/or the tribal council. Ethical people do not let unethical behavior to continue unchecked." "We are responsible for writing formal complaints and grieving Joe's behavior using policies and procedures to describe what is taking place. We are also responsible for modeling good work standards. When new employees, especially young people, come into an organization, we should reward good work habits and model a strong work ethic." So, if I disagree with Dr. Longie, what do I think about this? I am glad you asked me that question! "Some kinds of mental retardation you are born with." "Down syndrome is caused by an extra chromosome, specifically three of the 21st chromosome instead of the usual two. " The very general answers most people gave to this ethics question makes me think that this is an area they haven't studied or thought about very much. However, simply by taking these courses, I believe that is changing, and it will be a permanent change, because you can't unthink a thought. Ethics isn't a technique, damn it ! Steven Covey's Seven Habits of Highly Effective People is a good book with some pretty good advice. However, I think some people have missed the point. "You can't talk yourself out of problems you behave your way into." I know a manager who has read all the books. She does all of the things that Dr. Longie talks about in his ethics course. She makes sure that her new employees get an orientation when different co-workers are assigned to take the new person to lunch, explain different parts of the organization. Each person has a written job description and a semi-annual evaluation. She makes it a point to stop and speak to each of her employees on a regular basis. However ... it is all a complete fraud. The first time or two the employee might be fooled into having a conversation, but after a few minutes, the manager is visibly impatient to be on her way. Soon, they learn to just say hello and make a comment about the weather or the local sports team, and then she is on her way to "talk" to the next employee. The evaluation forms are designed exactly like Dr. Longie recommends, with measurable goals, a meeting with the supervisor to discuss these, regular meetings for 'monitoring' with written follow-up. The problem is that those employees who meet their goals and those who consistently fail at them receive the exact same response - none. No one loses their job. Everyone gets the same raise each year. Promotions are given to whoever the manager feels most comfortable working with, regardless of performance. On paper, this manager looks like the most ethical, competent person around, but she is just going through the motions. "It's all about the want-to ." He said you could give an athlete all the skills in the world, you could train until the cows came home but in the end of a match, it all came down to did that athlete really want to win badly enough to pour heart and soul into it. This manager has good technique, but the truth is that she doesn't really care about her employees. She cares about herself getting ahead and has down pat all the techniques to appear to be an ethical manager, but it isn't working for her. Because you can't talk yourself out of problems you behave yourself into. Does Anyone Believe in Honesty ? "Commitment from the top is very important on this because this is what sets the tone of the company." Furthermore, he warns that if the commitment by top management isn't genuine, then an ethics program will not succeed. "If there's the slightest indication of cynicism on the part of top management," he cautions, "then it's all over." This extremely true statement can be found about two-thirds of the way through the page from the Center for Ethics and Business at Loyola Marymount University, then the author goes on to another topic. Points for Dr. White for bringing this issue up, he is one of the few. However, he joins everyone else in the world in not giving this crucial fact nearly as much attention as it deserves. "I am smart and ethical and if the people working under me were not such bozos none of this bad stuff would have happened." It's very interesting that the exact company mentioned in the case study by Dr. White is General Dynamics, which, in 1985 was found guilty of some not just unethical but criminal practices which resulted in members of senior management being indicted and the company suspended from federal contracting, not once, but twice. It's interesting because I used to work for General Dynamics and I left there in 1985. I'd be very curious to know how this whole wonderful ethics program supposedly worked out with all of the same people there. I left, just coincidentally, because I was getting married, moving to another city and starting graduate school. There was no mass exodus of people from the company. So, although the studies I read, written by consultants and professors at universities that would like to get donations suggest that the program has been successful, I remain skeptical. A handful of senior managers did not defraud the government of hundreds of millions of dollars all by themselves. Hundreds of people knew about it, or at least suspected it. I was just a new, young engineer and I heard people voicing their suspicions. Many of the older managers joked about the over-charging and charging to the wrong contract. I am pretty good with computers (remember this was before Excel existed) and when I ran through some numbers and mentioned what I had discovered to management (what you're supposed to do, right?) only one person was shocked and surprised. He took it to his boss, he told him to drop it. He quit the company on the spot. I ended up married to that man, by the way. So, now, all of a sudden a new "Vice-president for Ethics" is appointed and all of those people who looked the other way are now completely honest and ethical.